La SIGEA - Società Italiana di Geologia Ambientale - Sezione Lazio e la Fondazione Marco Besso organizzano un seminario per la divulgazione del testo “I geositi del territorio di Roma Capitale” edito dalla SIGEA, nel quale sono catalogati 91 geositi, descritti nelle componenti paesaggistiche, geologiche, nei suoi rapporti con la realtà urbana e con corredo fotografico e cartografico, suddivisi per municipio. In un ecosistema complesso come quello urbano i Geositi così definiti hanno un valore culturale, rappresentando una “memoria storica” di quello che una volta era il paesaggio naturale e dei suoi aspetti geologici, che meritano di essere documentati per le generazioni future, e che ci permettono di ricostruire aspetti di Geologia urbana e di evoluzione del paesaggio, nonché comprendere come la storia e la cultura della città di Roma siano intimante connesse alla struttura del territorio. 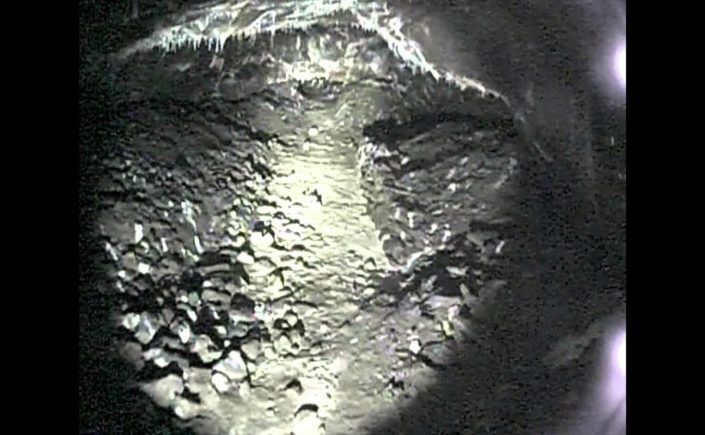 Nel corso dell’incontro saranno inoltre presentate, da geologi, archeologi, geoarcheologi, storici dell’arte ed architetti, alcune relazioni che descrivono, nel contesto geologico e geomorfologico dell’’area romana, alcuni aspetti poco conosciuti relativi all’uso del territorio ed alla evoluzione urbana, sia antica che moderna. 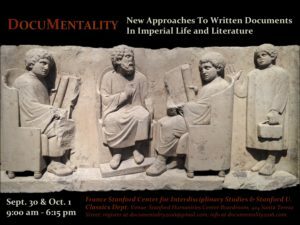 For questions or to register for the conference as a guest, contact: documentality2016@gmail.com. 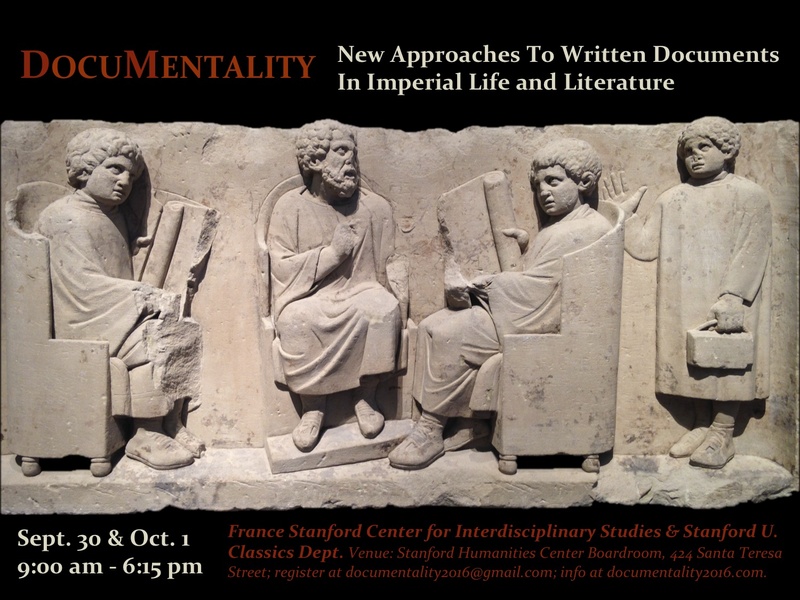 Documentality is sponsored by the France-Stanford Center for Interdisciplinary Studies and the Stanford Department of Classics. Tour of the Catacombs and Museum of Pretestato by Special Appointment (site normally closed to public). 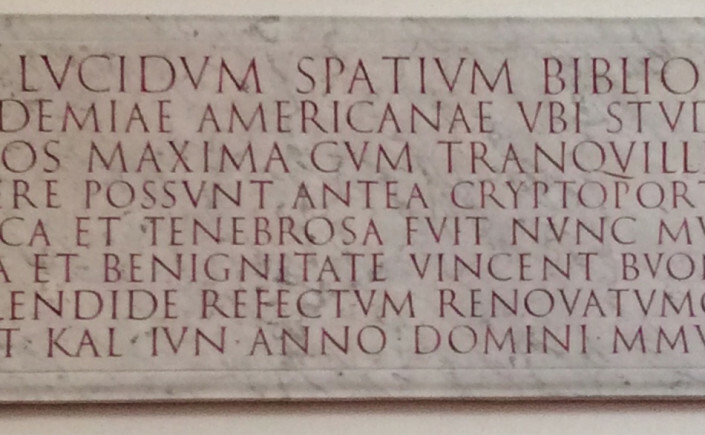 Address: via Appia Pignatelli, Rome. Group size limited to 15. Registration required at: http://www.sotterraneidiroma.it/ac3-sdr-tours. To visit the site on alternative dates, click here. 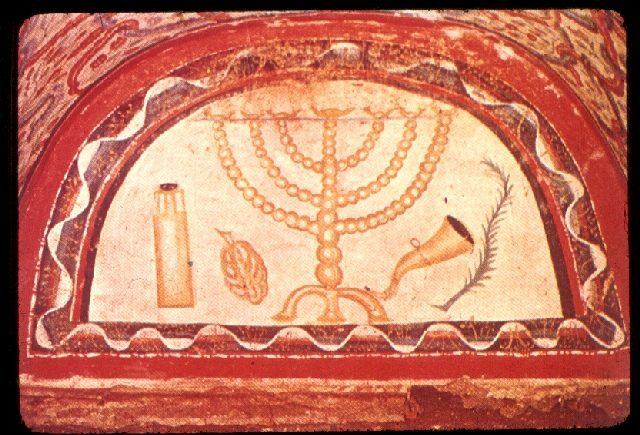 The Soprintendenza Archeologia, Belle Arti e Paesaggio della Basilicata in collaboration with the Centro Operativo di Venosa is sponsoring guided tours of the Jewish Catacombs of Venosa (PZ) during the Giornate Europee del Patrimonio (September 24-25, 2016). Tours will be held throughout the weekend of September 24-25, 2016 between the hours of 9 a.m. - 6 p.m.. The ticket price is € 2,50, also good for admission to the Venosa Museum and Archaeological Park. It is necessary to reserve a space on a tour in advance by calling: 0972 36095 - 339 4004298. The catacombs are located on Via Ofantina near the train station of Venosa (map). Event contact: Tel. 0971 489439; e-mail: antonio.rosa@beniculturali.it. Click here for information about how to visit the Jewish Catacombs of Venosa on alternative dates. 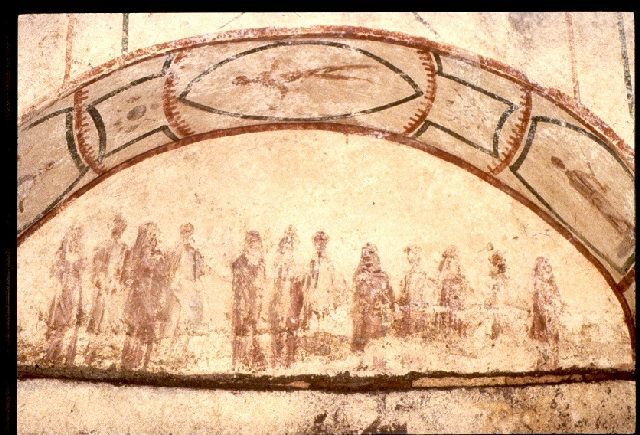 The Jewish catacombs of Venosa date to the fourth - sixth centuries CE, and are formed by tunnels excavated into the hillside that were subsequently developed and, in several instances linked by cross-galleries. The patterns of excavation for tombs in this communal cemetery appear virtually identical for the area's Christians and Jews. The Jewish site open to the public contains examples of loculi, forma (tombs in the pavement), and elongated niches, some squarish, some arched, that can hold multiple grave trenches parallel to the gallery. 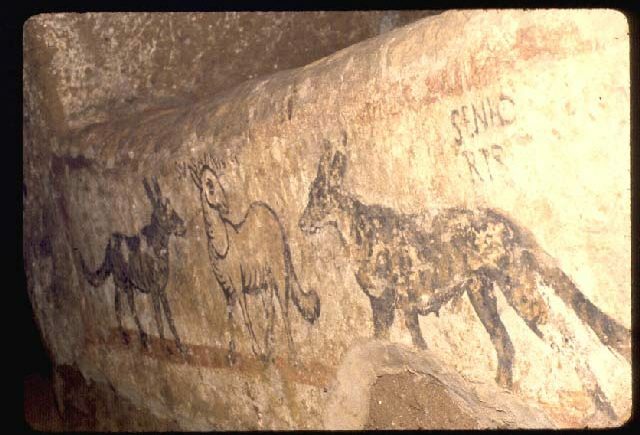 A number of painted inscriptions in Greek, Latin, and Hebrew are conserved, though in a fragmentary state, on some of these tombs. 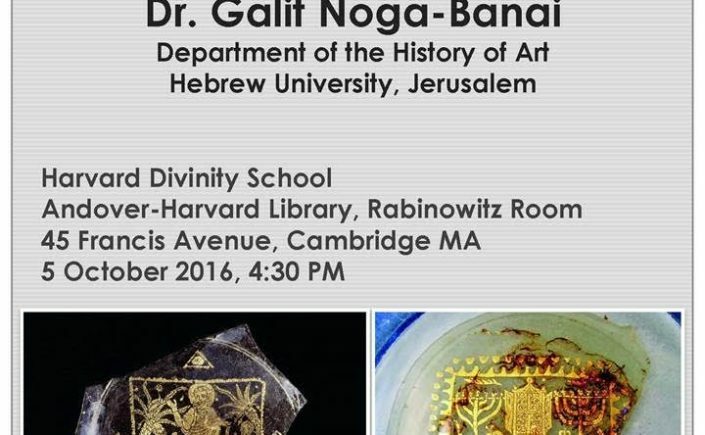 The texts of these have been published in English in D. Noy, Jewish Inscriptions of Western Europe, vol, 1, Cambridge, 1993 and the Fondazione per i Beni Culturali Ebraici provides an extensive photogallery of the inscriptions at this link. Unfortunately, the painted arcosolium illustrated above is not visible at this time. 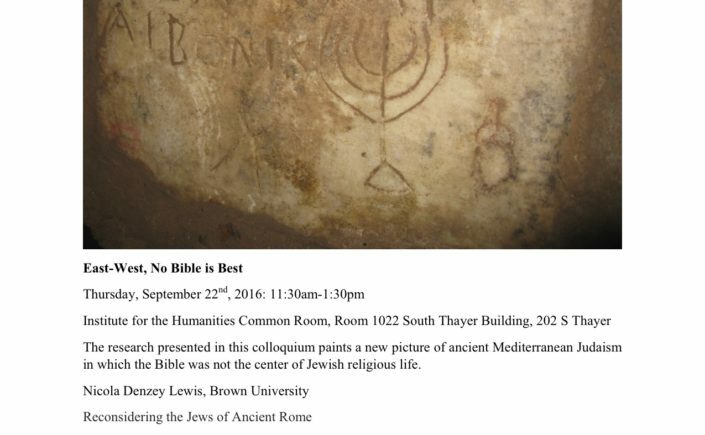 Beyond the Book Speakers Series at the University of Michigan presents: "East-West, No Bible is Best": A new picture of ancient Mediterranean Judaism in which the Bible was not the center of Jewish religious life. Thursday, September 22nd, 2016: 11:30am-1:30pm. Location: Institute for the Humanities Common Room, Room 1022 South Thayer Building, 202 S Thayer (University of Michigan at Ann Arbor). Flyer for event. 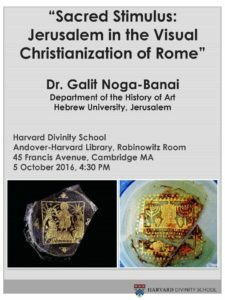 Nicola Denzey Lewis, Brown University, "Reconsidering the Jews of Ancient Rome"
About the Speaker: Nicola Denzey Lewis is currently Visiting Associate Professor of Religious Studies at Brown University and an International Catacomb Society Director. 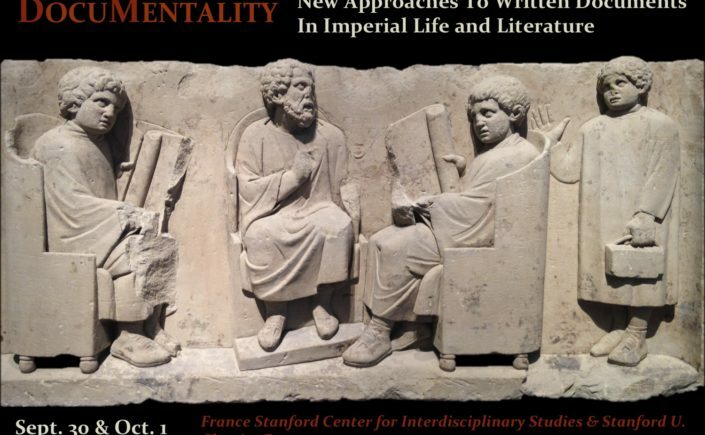 A social and cultural historian who specializes in the religious environment(s) of Rome from the second through the fifth century, Denzey Lewis is currently at work on her fifth book, The Early Modern Invention of Late Antique Rome. Denzey Lewis spent 2015-2016 at Princeton University as an ACLS fellow and continues this year at Brown as a 2016 2017 NEH recipient. Michael Legaspi, Penn State, "Aristobulus and the Hellenistic Argument for Judaism as Philosophical Piety"
Abstract: Fragmentary writings from the decades immediately following the conquests of Alexander shed valuable light on Greek perceptions of the Jewish people. Theophrastus, the famed student of Aristotle, praised the Jews as a “nation of philosophers.” Others from roughly the same time period (for example, Clearchus, Megasthenes, Hecataeus) joined him in describing the Jews favorably, as a group distinguished for its wisdom. Corresponding to this outsiders’ view were various attempts by Jewish authors in the Hellenistic period to commend Judaism to educated Greeks in precisely this way. The Alexandrian Jewish philosopher Aristobulus, who flourished in the middle of the second century BCE, is among the earliest examples of an elite, educated Jew attempting to ‘modernize’ Jewish belief in this way. A close analysis of Aristobulean fragments suggests an attempt not merely to coordinate the Bible to Greek paideia but rather to articulate a common philosophical source for both. In this way, Aristobulus goes ‘beyond the Bible’ in identifying the ancestral way of life with a philosophically eclectic form of piety. About the Speaker: Michael Legaspi is an associate professor of Classics and Ancient Mediterranean Studies and Jewish Studies at Penn State (University Park), where he teaches courses in biblical studies, ethics, and the historical backgrounds of Judaism and Christianity. He earned a Ph.D. in Hebrew Bible from Harvard University in 2006, writing his dissertation on biblical criticism in the German Enlightenment. This formed the basis for his 2010 book entitled The Death of Scripture and the Rise of Biblical Studies (Oxford University Press). He has also written on topics in biblical studies, theology, and the study of the Bible in early modern Europe. At the moment, he is working on a book-length study on the concept of wisdom in biblical and classical traditions. Respondent: Celia Schultz, Professor of Classical Studies, University of Michigan. Rackham Dean’s Strategic Initiative Fund. If you have any questions or you would like to receive the rest of the 2016-2017 calendar for the Beyond the Book speaker series, contact Rebecca Scharbach Wollenberg (rwollenb@umich.edu). 23-24 March 2017 (link to CFP pdf). The variety of the material appearances of photography is one of its defining characteristics. 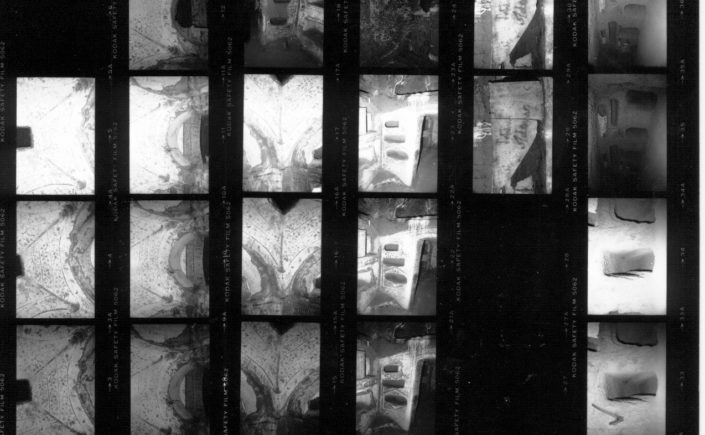 As flexible medium photography adapts to new historical, cultural and aesthetic realities. The function and effect of photography differs depending on their contexts. Photographs can be encountered on the one hand as real, material artefacts, e.g. as exposed metal plate or as enlargement on photographic paper, or on the other hand as immaterial projection or in digital form. Especially in the early days of photography, a wide variety of photographic techniques and reproduction methods was used and further developed according to specific purposes and intentions. The workshop intends to critically examine the relationship between the factuality of photography – in the sense of the actual material conditions – and its utilisation in different contexts in the second half of the 19th and the early 20th century. What photographic techniques, which formats, materials and systematisations were used in which contexts? What part did the photographer, the customer and the recipient play? Which forms of utilisation can be distinguished? What is the role of the subject of the photographs? What were the differences in terms of production and function between genres like documentary photography, reproductions of works of art, travel photography or landscape photography? What was the relationship of photography to other forms of visualisation? How did different contexts determine techniques and vice versa? How were photographs used by recipients, under which circumstances were they purchased, when and how were they manipulated, copied, signed, coloured and finally classified, archived, and re-used? How did communication by photographs work and how were they used to convey messages and knowledge? Contributions are welcome based either on concrete case studies (e.g. a convolute, a photographer, a recipient, etc.) or on general aspects on the relationship between factuality, presentation and utilisation of early photography in a diachronic or synchronic manner. The workshop aims at bringing together scholars from various disciplines who study early photography or in which photography played a significant role in its early days, like archaeology, history of art and media studies. Interdisciplinary approaches are welcome. Please send your abstract and a short CV to fototeca@biblhertz.it and fotothek.rom@dainst.de by October 16, 2016. Travel (economy class) and accommodation expenses will be covered for invited speakers. Organisation: Tatjana Bartsch, Johannes Röll (BH), Ralf Bockmann, Paul Pasieka (DAI). (NewBrunswick.Rutgers.edu): The Department of Classics at Rutgers, The State University of New Jersey (New Brunswick) is pleased to invite applications for a tenure-track position at the rank of assistant professor, to begin in September 2017. We seek a Classicist with a primary teaching and research interest in Roman-era material culture; along with more traditional material culture interests, such as art and archaeology, we also welcome applications from those who engage with the intersections of text and material culture. Preference will be given to those who complement the research interests of the current faculty. Tenure-track faculty in Classics are expected to teach 2 courses a term, which in the case of this position might include a Classical archaeology course, in addition to undergraduate and graduate advising, service obligations, and research. Applicants should have completed a PhD (or equivalent) in Classics or in a related field with Classics specialization by September 1, 2017. Please send a cover letter detailing your research and teaching interests, CV, teaching evaluations (please send a complete set from 1-3 courses), and 3 letters of recommendation via Interfolio. Additional materials may be requested from short-listed candidates. For full consideration, send materials by October 31, 2016. The department will interview in person at the SCS in Toronto or via videoconferencing, if candidates prefer. You may direct any questions about the position to Professor James McGlew (jmcglew@rci.rutgers.edu). Please visit https://apply.interfolio.com/36825 to find a complete job description and to submit dossier. (Source: AAR.org): The American Academy in Rome invites applications for the position of Director of its six-week Classical Summer School, beginning in summer 2018, for a term of three years (2018-2020). It is customary for the director-designate to shadow the incumbent in the summer preceding (2017). ORGANIZATION The American Academy in Rome, founded in 1894, is an independent, privately funded institution that provides opportunities for American artists and scholars to pursue scholarly or artistic projects in close association with the cultural heritage of Rome and the Mediterranean Basin. through a careful study of material remains and literary sources. Considerable time is also spent on discussions of pedagogy, and integrating the knowledge gained in the course into the teaching of Greek, Latin and courses on the ancient world. The New York office of the Academy will provide assistance on publicity; preparation of guidelines and informational materials on the Summer School; mailing of flyers and applications to interested candidates; and other general administrative and accounting tasks. The Rome office will help arrange for permissions and other local travel arrangements in and around Rome. work: referees will be contacted only for short-listed candidates. Please submit this material by e-mail no later than OCTOBER 21 2016. Send all material to Kim Bowes, Director: k.bowes@aarome.org. All applications will be acknowledged by e-mail within one week. Candidates to be invited for an interview will be notified that they are finalists by 18 November 2016. INTERVIEWS: Short-listed candidates will be interviewed at the SCS/AIA meetings in Toronto in January 2017. IMPORTANT: Please submit (2) separate documents attached to your email message. Both documents should be in PDF file format. Indicate “CSS Director” search in the subject of your message. Do not place your letter in the body of your email message. It should be attached as a PDF document to the email. 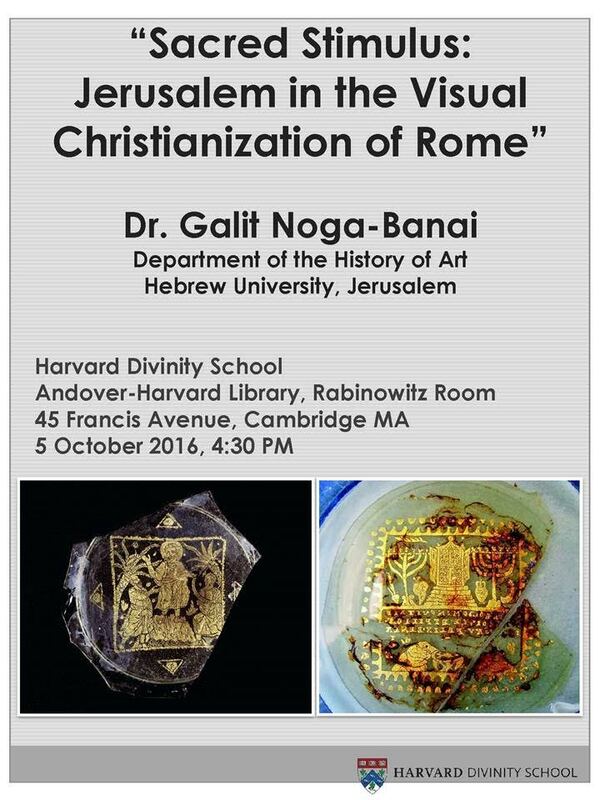 "Sacred Stimulus: Jerusalem in the Visual Christianization of Rome"
Speaker: Dr. Galit Noga-Banai (Hebrew University of Jerusalem, Department of Art History). October 5, 2016 at 4:30 p.m.
Special tour of the Hypogeum of the Aurelii with the Association "Roma Sparita" on Sunday, October 23, 9:45 a.m (please come early - no latecomers will be admitted!). Meeting point: Via Luigi Luzzatti, 2 - Rome. It is necessary to reserve and pay in advance to secure a spot on this exceptional tour (group size limited to 15). Link to reserve: https://www.romasparita.eu/visite-culturali/visite-guidate-in-programma/636/roma-sparita-allipogeo-degli-aurelii/. Tickets cost 20 euro for Roma Sparita members; 25 euro for non-members, and 10 euro for those in possession of a Roma Sparita gift card. It is strongly recommended to wear comfortable clothes and shoes and not bring large bags into the site. Please bring your own flashlight. Pictures of the Hypogeum of the Aurelii are available at this link.